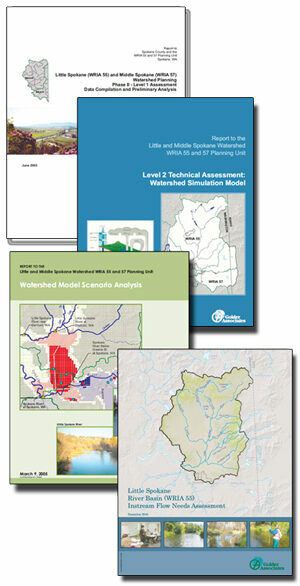 Numerous projects were completed within WRIA 55/57 during the development of the watershed plan, development of the detailed implementation plan, and implementation of both plans. Links to the project reports are provided below. Little Spokane River Hydrogeologic Studies: A data gap recognized during the development of the watershed plan and implementation plan was data related to the hydrogeology of the Little Spokane River Basin (WRIA 55) The group invested in hydrogeologic data gathering, culminating in a study conducted by the USGS. Surface Water Storage & Wetland Restoration: A key issue in water resource planning is stream flow during the late summer months. During this time of the year water demand is at it's highest and stream flows are at their lowest. One strategy to deal with this issue is to store water during the spring time and release it during the late summer months. Another is to restore wetlands so that water during the spring is retained rather than running off, and recharges groundwater, which supports late summer stream flow. Spokane County, in conjunction with Stevens and Pend Oreille Counties, is evaluated the use of a water bank in Water Resource Inventory Area (WRIA) 55, the Little Spokane Watershed. Development of a Policy Advisory Group to guide and inform all aspects of the project. Evaluation of water bank structural and operational options. The project is funded by a grant from the Department of Ecology.